There was a highlights reel of goals on The Late Late Show and the Late Late never showed football so you knew this World Cup thing was going to be big. 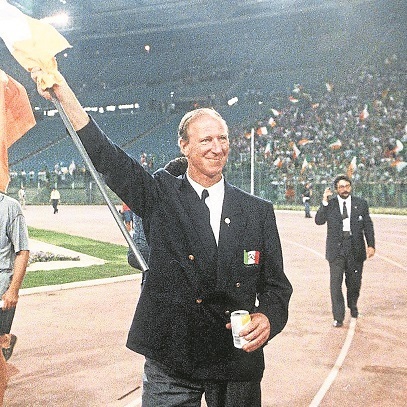 The local landscape was awash with the kind of gaudy clothing and never-to-be used-again accessories that you’d otherwise never wear, or buy, but Italia ‘90 enabled bad fashion and Dunnes in Newbridge had a boon. Jack the Lad t-shirts, Jack’s Army headscarves, Shake a Shamrock. We’d park in Quinnsworth on the Blessington Road in Naas, baked out of it in the back seat of the car and fighting for headroom with passport picture cut-outs of Kevin Sheedy and John Aldridge and Ray Houghton, all stuck to the windows with rubber suction pads. Pictures of the Irish team were everywhere. Kind of like the way it must be now in North Korea now with Kim Jong-un, only multiplied by eleven in this context. There was a poster of Jack Charlton advertising an Opel Cadet on the gable of Brown’s Barn on the Dublin Road and in every other picture he’d a cap on his head and cup of tea in his hand. Barry’s, I think. Or was it Lyons? I can’t remember. Only that there was one degree of separation between him and us because local man Donie Butler was then a big player in the FAI and Jack was sometimes spotted being driven into his estate — the Paddocks. Hayde’s and Lane’s and the Gem, and more, sold Italia ‘90 football stickers and I’m not joking when I say that gripping an unopened packet elicited the kind of euphoric anticipation Charlie Bucket must have felt before he ripped back the wrapper on his Wonka bar to reveal the last golden ticket. Thousands of miles from Buenos Aires, on the southern edge of Dublin, Diego Maradona will never know how much delirium the hunt for his sticker caused in Kildare. There was another emerging star then, though, a Dutch fella, with long dreadlocks, called Rudd Gullit. But for some reason, everyone down the Caragh Road pitches was calling him Rudd Gilly. Top Twenty, when it was across the road from the church on the Sallins Road, was stocked to the hilt with Put Em Under Pressure singles and the catchy chorus boomed out the door. I still have the single somewhere. Decades later, that World Cup single would whip the Stand House on the Curragh into a contagious frenzy during a friend’s wedding. It rained the night we played England in Cagliari. But Naas was like the Mezzogiorno the same evening. The sun was so strong we had to close the curtains. After Sheedy scored the equaliser, we opened them wide, drove up and down the Main Street and tried to wear out the horn on the car. It was like the Arab Spring, without the gunfire. I suspected that after Eamon Dunphy’s withering appraisal of the draw against Egypt that he’d have been put against a wall and shot if he ever set foot in Naas, but it was all forgotten after Rudd Gilly, I mean Gullit, had his goal cancelled out by Niall Quinn in the last group game against Holland. The hero of the song we sung loud that night settled in Kildare soon after, and in a curious way became equally well regarded in some quarters for a goal-fest, scored in the colours of Eadestown against Sallins, much later on. The Romania match was our rite of passage of course. It was my first time in a pub, without an adult. I was 12, it was the old Finan’s and we lasted about five minutes. We just wanted to drink in the atmosphere... honestly. Then we skulked home to a friend’s house in Lakelands to watch Sheedy, Houghton, Townsend, Cascarino, (Bonner’s save), and O’Leary propel Ireland into the quarter-finals. That night, after George Hamilton’s never to be forgotten statement and more joyous laps of Naas Main Street, we succeeded in wearing out the car horn and in truth, if there was gunfire in the sky around Market Square it wouldn’t have felt misplaced. The build up to the Italy match felt prophetic. It was in Rome — the Pope’s place — and as well as the local landscape being awash with gaudy green World Cup wear, it was dotted with a clatter of pre-teens called John Paul. That was the legacy of the Pope’s visit to the Phoenix Park years before. However, an arrival from overseas around the same time was arguably more significant and more culturally impactful by the time this tournament came around. The Italian-owned Capri Grill in Poplar Square became the frontline in the build-up to that game against the Azzurri. Drunken banter ran for nights and nights and I often wondered if the Borzas were tempted to tip some ricin in with the chip salt. Instead, they smiled and took our money. It was all very good natured in fairness… until Toto Schillaci scored the winner for Italy. Then, someone suggested we should boycott the Capri. If we did, our resolve didn’t last. One whiff of vinegar on the very next visit to the Gem probably. Anyway, a few days later Argentina bate them and things returned to normal again, sort of. We put away the the Jack the Lad t-shirts and the Jack’s Army headbands, but never would we throw them away. Years later, a neighbour from Naas told me that he had to listen to the penalty shoot-out win against Romania on a car radio on the Northern edge of France. His family had gone on holidays just before the tournament and they’d missed the entire World Cup.